Apparently it was finally confirmed that Europe will get three places in the Hongkong World Series Qualifier 2019. Therefore Germany is through, Russia is nearly there but still could lose the 14 points they are ahead of Portugal in theory as they just play for 5th place atm. Portugal goes to HK, if they win it and Russia doesn't finish 6th or better. Sort of best ever achievement for german rugby? 2nd place at the Olympic Games is the best result ever archived by a german rugby team. Japan wins first Asian 7s leg in Hong Kong. Ivory Coast hosted and won the Regional 7s (North/West) in Abidjan today. 8. Guinea (making their 7s début). In the final, apparently it was Ivory Coast 15-17 Nigeria and the referee did not see the conversion, so had to consult with others - and it was given so the scores were 17-17. Ivory Coast then won the match in extra time. Nigeria are possibly disputing this with Rugby Afrique. The (South/East) edition will be competed for by Burundi, Congo, DR Congo and Lesotho. The top men's and women's finishers at this year’s RAN Sevens will book their tickets to the HSBC World Rugby Sevens Series 2020 Qualifier in Hong Kong, in April next year, while the top two men’s and women’s teams will be off to compete in the Pan American Games 2019 in Lima. 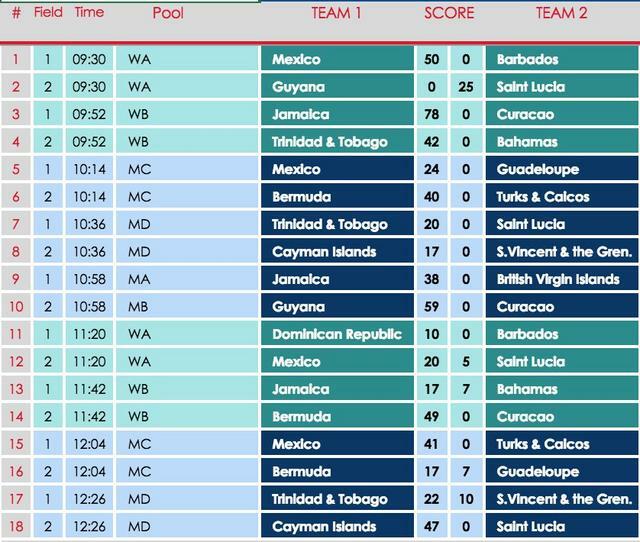 As an added incentive to do well, finishing positions in Barbados will determine seedings for the 2019 RAN Sevens, which doubles as the Tokyo 2020 Olympics qualification tournament. Jamaica find themselves in Pool A alongside the Dominican Republic and the British Virgin Islands, while beaten RAN 2017 finalists and six-time champions Guyana are joined in Pool B by Barbados and Curacao. 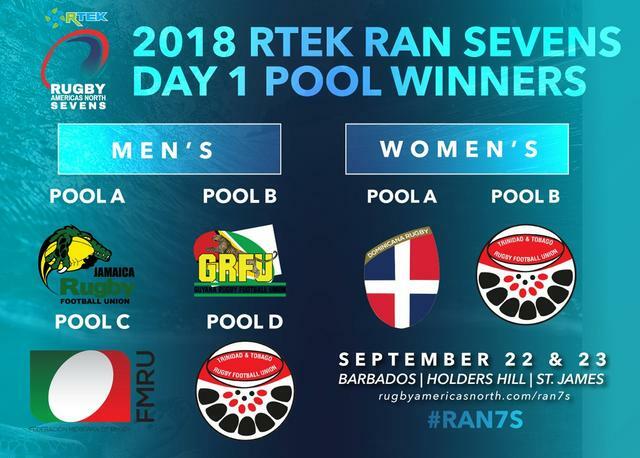 Last year’s hosts Mexico, silver medallists at the recent Central American and Caribbean (CAC) Games, take on Bermuda, the Turks & Caicos and Guadeloupe in Pool C and Trinidad & Tobago, Cayman Islands, St. Vincent & the Grenadines and St. Lucia make up Pool D.
Congratulations to both of our repeat #RAN7s Champions! Rugby Mexico Women and Jamaica Rugby Football Union Men will go on to the World Rugby Sevens series Hong Kong Sevens and the Lima 2019 Pan American Games! Presumably this is the draw for the Africa Men's 7s 2018, to take place in Tunisia in a fortnight. You can always check my website - it is basically a simple list of results, all in one place. As far as I know, there isn't another website that has all the rugby 7s results in one place. Meanwhile, the African South/Central Regional 7s have just finished in Bujumbura, Burundi. So still no news about the World Sevens Series stops 2019/20. I heard rumours that it is apparently between Singapore, Fiji (not sure which city there) and Munich and a decision is actually due soon. I really hope it is Munich. Maybe I am selfish. Maybe I hope the Dutch team will get an invitation. NedRugby wrote: Maybe I hope the Dutch team will get an invitation. I think I must have assumed it was women's 7s. We are still a long way off NL having a men's 7s team for some reason. Eine höllische Mannschaft wäre furchtbar. 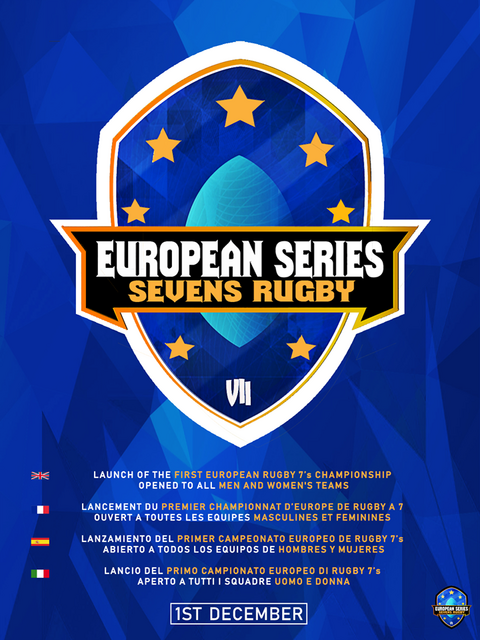 The Bruxelles 7s promises the arrival of a new European Series/Championship, "opened to all men's and women's teams"
NedRugby wrote: I think I must have assumed it was women's 7s. We are still a long way off NL having a men's 7s team for some reason. Netherlands actually had a not bad 7s team, but for some reason, after finishing 3rd and 4th in the European 7s A Division in 2013, they haven't played since. mcruic wrote: Netherlands actually had a not bad 7s team, but for some reason, after finishing 3rd and 4th in the European 7s A Division in 2013, they haven't played since. They almost went bankrupt at the time with a deficit of almost a million Euros. They had to cut costs so amongst others the Mens Sevens program was abandoned. After that it was found that it was better to focus on enforcing grass roots rugby, youth development and a national XV's HP pathway. Sevens adds little but takes away resources which can be better spent elsewhere. Sensible reasoning if you ask me. According to the logo, it's the 4th edition of the Arab 7s. Looks like Egypt will win this. Would be nice to see Iraq and Sudan score some points. They will now have 2 games against each other (last group stage match, and 5th place match). UAE looks slight favourites to reach the final, but Libya could reach the final if they beat UAE in the last match. Note: Libya (not Lybia) - this seems to be quite a common spelling error!